Galderma has introduced two revolutionary products to treat nasolabial folds (NLF), more commonly called laugh lines: Restylane Refyne and Restylane Defyne. With both Refyne and Defyne gaining approval by the Food and Drug Administration (FDA), Advanced Dermatology Center in Burbank is excited to announce we are offering these products to our patients. Refyne has been approved to treat moderate-to-severe facial wrinkles and folds, while Defyne has gained approval for the treatment of moderate-to-severe deep facial wrinkles and folds. How Do Restylane Refyne & Defyne Work? Both Restylane Refyne and Defyne are dermal fillers that are injected just under the facial skin. Once the injection is completed, the product will help smooth away your lines and wrinkles. In this way, Restylane Refyne and Defyne both serve as minimally-invasive, low-risk cosmetic dermatology options. How are Refyne and Defyne different from the other fillers already available? These breakthrough injectable fillers will actually move and contour with your face as you make facial expressions, which results in a natural appearance that does not appear to be forced, modified, or altered in any way. If a soft, natural, and never-stiff look is what you would like to achieve, Refyne and Defyne could be the right choice for you. 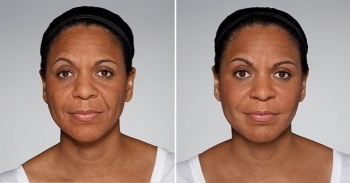 Areas Treated - Restylane Refyne and Defyne are used to correct moderate to severe facial wrinkles and folds, such as deep laugh lines (nasolabial folds and marionette lines). Results - The appearance of wrinkles and facial folds are smoothed by adding structure and volume underneath and bringing creases back up to the surface. Treatment Interval - Most patients experience correction for 9-12 months, however some patients may need to return for another treatment before that time. Recovery Time - Immediately after the treatment, there may be temporary swelling or redness, for the first day. As with any injectable filler, there is a chance of bruising, particularly in individuals taking aspirin or other medications that may thin the blood. This typically resolves in less than one week. Your nurse or physician injector can educate you on ways to avoid or decrease the likelihood of this happening. Our Burbank dermatology team offers medical and cosmetic dermatology services and treatments to people throughout Southern California. If you would like to know more about Restylane Refyne and Defyne, or if you believe the products would be perfect for your laugh lines, please do not hesitate to talk to our Burbank dermatologists today. Contact us today, you can use an online contact form or dial (818) 284-4003 – whichever is easier for you.